Indeed, Montenegro will hold as equal a voice as America herself in formulating NATO’s foreign policy actions. It is safe to presume the Montenegrin government – having pushed through in militarizing its state – will have no scruples in participating with future NATO engagements, to add to the past illegal attacks on Afghanistan, Libya, etc. The expected arrival of newly-named “North Macedonia”, which will bring the number of NATO states to 30, is a further upcoming event that must have the Trump cabinet clamouring in anticipation. As with Montenegro, North Macedonia is a tiny country located in the Balkans, and is less than a third the size of Ireland. Yet the New York Times is pleased with the prospect of North Macedonia’s addition to NATO, expressing last month that it “plugs another gap in what was once the former Soviet Union’s backyard”. One can imagine the New York Times’ reaction would have been rather different, had the Soviet Union persuaded Nicaragua to join the Warsaw Pact. Russia, we are told, has no right to be concerned about the unremitting expansion of NATO, which has almost doubled in size over the past generation. Trump’s analysis pertaining to the possibility of “World War III” is not without foundation. NATO’s march eastwards, in violation of verbal promises expounded following the USSR’s capitulation, has undoubtedly increased the likelihood of World War III unfolding. A third world war, which would entail a nuclear conflict between the United States and Russia or China, is a scenario that spells the end for entire humanity. One of NATO’s broadly reported maxims is “an attack against one ally is considered an attack against all allies”. Such mottos put into perspective the mindset of an organization geared towards military combat, with much of its focus on a nuclear superpower in Russia. There are further plans by Washington to incorporate the Ukraine and Georgia (Stalin’s birth country) into NATO, two states situated directly on Russia’s western and southern borders respectively; should either nation accede, it would represent an enormous provocation of Russia and could conceivably trigger a nuclear war. 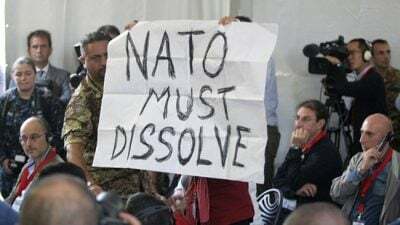 Despite the fact that NATO enlargement, along with various interventions of the alliance, poses a clear threat to mankind, Western political figures have long championed these policies, as have commercial media. Powerful institutions are, therefore, openly supporting the increased possibility of humanity’s annihilation. A New York Times editorial from 26 January 2019 pronounced that NATO “has been the foundation of trans-Atlantic stability and prosperity for seven decades” while it “continues to keep a predatory Russia at bay”. There is no mention in the Times’ evaluation of NATO’s rapid advance towards this “predatory” Russia. “The greatest achievement of NATO is that it has helped to keep the peace in Europe – with occasional exceptions – for more than 60 years… this is an epochal achievement on the grand historic scale”. One of the “occasional exceptions” was NATO’s flagrantly illegitimate invasion of Yugoslavia 20 years ago, which killed thousands of people, and included such depredations as the deliberate bombardment of Radio Television of Serbia (RTS) headquarters, along with the Chinese embassy’s destruction in Belgrade, Serbia’s capital. Attacks like this constituted outrageous war crimes in which no one was charged, as the victors in conflict seldom are. The US-led assault on Yugoslavia even provoked criticism from Israel’s Ariel Sharon, who described it as an act of “brutal interventionism”. 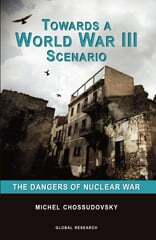 The continuing issue of NATO’s existence and eastward spread has been highlighted over successive years by scientists running the Doomsday Clock – whose hand is currently at two minutes to midnight (apocalypse). In the atomic scientists’ 2019 review they assess that, “The United States and Russia should discuss and adopt measures to prevent peacetime military incidents along the borders of NATO”, which are placed at Russia’s very horizons. In a New York Times opinion editorial from January this year Ursula von der Leyen, the German defence minister, writes that NATO “represents a special, even emotional bond between the American and the European continents… Maybe the most basic benefit of NATO is that it provides reliability in an unreliable world”. Indeed, “reliability in an unreliable world” with strategies leading to the growing threat of a planetary nuclear holocaust. Von der Leyen has for months been tipped to succeed Stoltenberg as NATO’s Secretary General, so one can expect business as usual in the time ahead. Von der Leyen is simply reiterating what her leader Angela Merkel has been remarking for years. Since Trump entered office in January 2017, Merkel has openly complained that America no longer “protects us”. It is incredible to witness the willing subservience that the Germans, with their long history of bloody militarism, are placing upon the armed forces of another country thousands of miles to the west. Comments like those, as expressed by Merkel and Von der Leyen, would have horrified Germany’s old soldiers from bygone eras, such as Helmuth von Moltke, Erich Ludendorff and Paul von Hindenburg. One may assume that these vaunted military figures have been turning over in their graves somewhat. Germany today is compromised in both action and thought. In all of the elapsing decades, the German state has never fully recovered from Hitler’s assumption to power in January 1933. Much of the blame for Hitler gaining the Chancellorship can be laid at the door of 53-year-old Franz von Papen – the conservative politician, nobleman and staff officer, who felt he could control the Nazi leader once he became head of state. Von Papen misjudged Hitler to a grave degree. The aspiring dictator possessed a terribly brutal and crazy streak, as later borne out by his organized genocide and merciless invasion on the Eastern front. However, to portray Hitler as a complete raving lunatic is not only inaccurate but serves history no purpose whatever. Albert Speer, former German architect and war minister, who achieved a well above average IQ score at Nuremberg, knew Hitler intimately for over a decade – and Speer noted in his postwar writings that the Führer was no carpet-chewing madman, but someone containing a variety of character traits, including that of being “genial” before later becoming “a forbidding despot”. After the war, Speer had come to despise Hitler, so in his books he was hardly defending the dictator out of admiration or loyalty. In his split personality, Hitler was also an extremely cunning individual and skilled politician who, once with power in his grasp, would isolate and eliminate any rivals while strengthening his grip on the state. Von Papen, with a new role in 1933 as “Vice-Chancellor”, was by the following year marginalized through Hitler’s ruthless maneuvering – forcing his second-in-command to resign in July 1934 and proposing him to take up an ambassadorial position in Austria, which Von Papen meekly accepted. Hindenburg himself, for much of the early 20th century a national icon in Germany, has shipped much criticism down the years for apparently overseeing Hitler’s rise to power. Yet in January 1933, the 85-year-old Hindenburg was in poor health and entering the final 18 months of his life. Hindenburg was, more than anything else, a military man whose service dated all the way to the mid-1860s, and he was unavoidably lacking in political guile. Hindenburg was in many ways steeped in the lost years of his past which he reminisced on with some regret; and he continued ruing the Germans’ failed Spring Offensive of 1918 on the Western front, which signalled the beginning of the end of World War I.
Hindenburg was noted for his modesty and distaste of the limelight, while allowing his long-time colleague Ludendorff to enjoy much of the acclaim. Rather than comprising a political sort, Hindenburg was most comfortable overseeing the field of battle, analyzing maps in his methodical Prussian manner, handing out orders to young and precocious officers. Though no angel, Hindenburg did not believe in anything like the Nazi vision, which was too extreme for his tastes. He was an old-fashioned conservative and monarchist, brought up in a family of minor nobility in the Kingdom of Prussia. He met Hitler for the first time during October 1931, at a crowded room in Berlin; those present observed Hindenburg’s disdainful attitude towards Hitler and the cool body language between the pair. The following August, in 1932, Hindenburg said after another conference with Hitler, “That man for a Chancellor? I’ll make him a postmaster and he can lick the stamps with my head on them”. The aristocratic old soldier was not to be seen mingling with the riff-raff amidst beer halls, and he disparagingly referred to Hitler as “the Austrian corporal”. Like Von Papen, Hindenburg was underestimating Hitler, but the former had in addition assured Hindenburg that, in the new government, he could ably restrain Hitler. During Hindenburg and Hitler’s more frequent personal meetings in 1933 and 1934, the Field Marshal would before long prove no match for the Corporal – with the latter even partially winning over the “old gentleman” with his psychological games and political tactics. Once Hitler was allowed control over Germany, the only means to remove him was through firm actions early in his rule when he was still vulnerable or, failing that, assassination. With Hitler running Germany, that country inevitably became a tyrannical dictatorship which plunged into a major European war that, at first, it seemed like winning with one triumph secured after another. By mid-December 1941, as Operation Barbarossa was beaten back by Soviet armies in the East – allied to Hitler’s decision in declaring war on the USA that month – Germany was thereafter in opposition to three of earth’s strongest countries: The USSR, Britain and America. The writing of defeat was engraven on the wall. Had Hitler been thwarted nine years before in his bid to grasp power, a second global conflict may well have materialized regardless; again most likely due to the severity of measures implemented against Germany at the 1919 Treaty of Versailles by the Western states. Nevertheless, those crimes against humanity perpetrated by Hitler’s Reich would surely not have occurred under any other German leader. In that case, Germany would likely have emerged from a second world war, defeated or otherwise, in a position where it was not dissected for over 40 years between the planet’s dominant nations. Since reunification in October 1990, a diminished German state has been a virtual US client entity belonging to NATO, and further influenced by American financial institutions like the IMF and World Bank. Germany may have regained some strength at the head of the European Union, but her foreign policy initiatives are usually dictated by Washington, with German troops as part of NATO present in Afghanistan, Iraq and across eastern Europe.